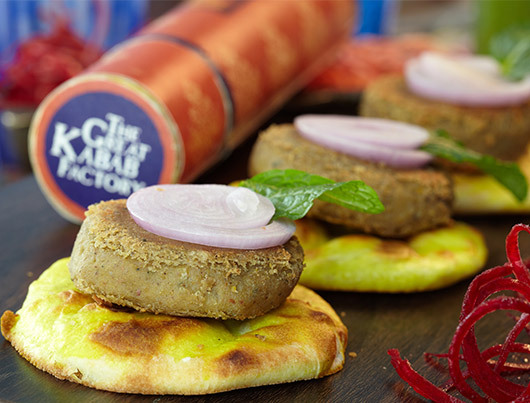 Our signature kababs have been created after a decade of extensive research and development. We proudly own a recipe bank of over 450 kababs which include many closely guarded family recipes passed down through ages. Various imitations have been created but none match the unique flavours and aromas of the original TGKF signature kababs. "If kabab is the king of snacks, then The Great Kabab Factory had to be the king of kingmakers"
The Great Kabab Factory is a contemporary and stylish Indian specialty restaurant offering a unique dining experience. Using recipes combining the ancient with the modern, TGKF brings delectable kababs from all over the world to one table. A different menu is set for each day and guests are served unlimited servings of each dish, either vegetarian or non-vegetarian. Besides our signature kababs, the meal comprises of dal factory, biryani, a selection of Indian breads and the best of seasonal vegetables and desserts. 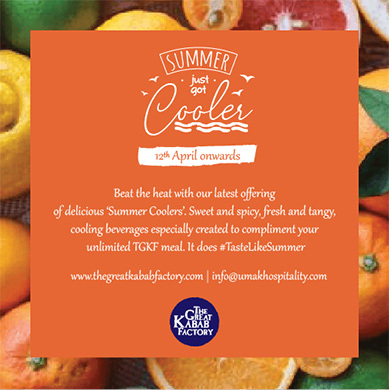 "For a person looking for an insight into kebabs, this would be a place to pamper one’s taste buds"
The first aspect that greets you at TGKF is its energy. 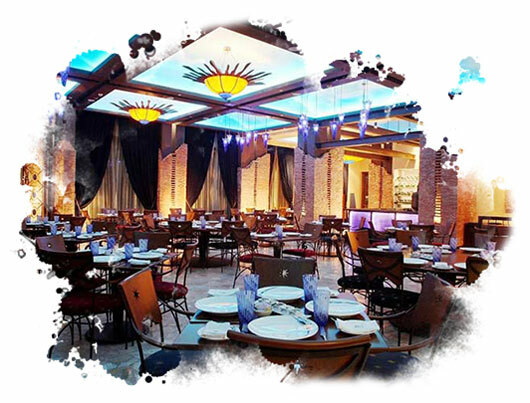 The vibrant colours, the lively sounds, and the distinct ambience add an ethnic yet contemporary look to the restaurant. The spatial arrangement of the outlet includes an open kitchen that holds centre stage in the restaurant. TGKF gives the experience of dining within a virtual food factory. Our cutlery, serving dishes and the factory style uniforms of the service staff add to the thematic concept. "A perfect lets-not-cook tonight spot with a great ambience, vibrant colors, and an open kitchen." 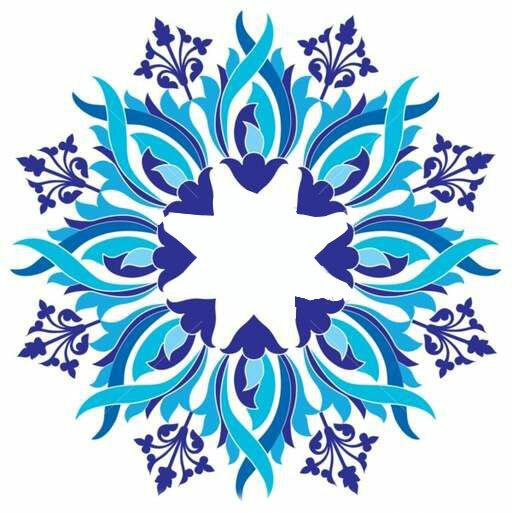 For exciting offer and updates, share your details! This month, let your taste buds experience, the exquisite flavors from the land of golden sands. 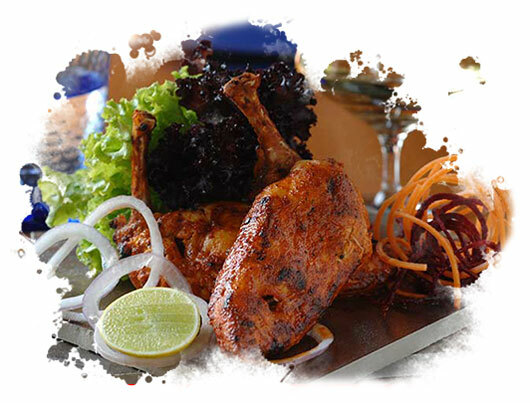 The Great Kabab Factory brings you one of a kind spectacular food festival right at your table - Rangeelo Rajasthan. Experience some of the exquisite and authentic delicacies all the way from the royal kitchens of Rajasthan, crafted by our culinary master chefs. And embark on a magical journey of culinary delights, like a true royal. Enjoy rustic delights from the heartland of Rajput warriors, from the fiery ‘Lal Maas’ to the fragrant ‘Junglee Ghost’and‘Degi Mirch Jhinga’, guests will leave wanting more. Vegetarians have a variety to choose from as well – delicacies like ‘Gutta Curry’, ‘Jodhpuri Aloo’, ‘Chaamp Ki Biryani’ to more exotic dishes like ‘Jodhpuri mutton Biriyani’ and ‘Rajasthani Chicken Pulao’. Of course, desserts cannot be far behind – indulge in warm Ghewar, Gujjia, Mawa Kachori & Ankoorit Moong Dal ka Halwa and more. 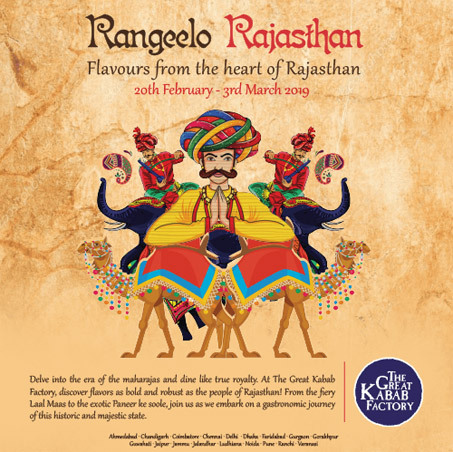 Experience the novelty of Rajasthani delicacies combined with an authentic blend of exquisite flavors at The Great Kabab Factory. This satisfying dining experience lets you soak in a bit of culture and the royal Rajasthani hospitality.